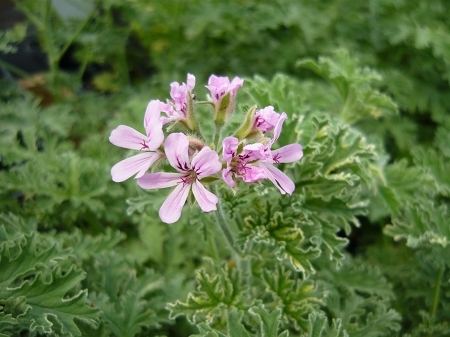 Gray Lady Plymouth Scented Geranium - Light rose scent. Deeply divided grayish green leaves sport a cream colored edging. Dainty pale pink flowers when in bloom. The beautiful leaf variegation and vigorous semi-upright growth habit make this a beautiful container plant. Perennial zones 10-11+. Live starter plant in 3 inch container. Wow, beautiful, large started plant! Great value, and excellent plant! Look forward to more plants from Colonial Creek! I have no idea how Colonial Creek is able to ship their plants so well. LOVED all of my order, but especially this velvety beauty, in perfect condition and bigger than I expected! I'm looking forward to making more orders.